With Amazon edging towards becoming the world’s first trillion-dollar company, fresh attention is being paid to the factors that could derail its growth. The company slowed a bit this quarter, sending the stock down eleven percent. Nevertheless, this downtick should not distract from the reality that Amazon has emerged as the new model of innovation effectiveness. They are something new in the innovation realm. They have moved so fast for so long, implemented so many new product, process and business model innovations, that their playbook is suddenly the standard by which every company must measure itself against, or get left behind. Amazon is the new model going forward. 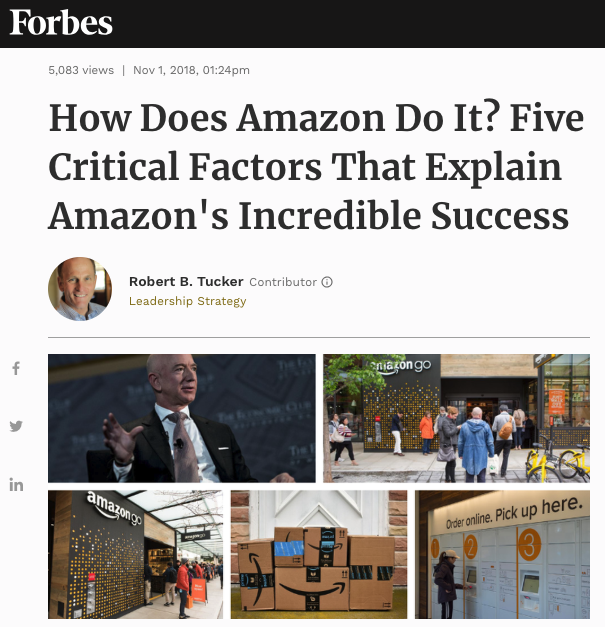 Through trial and error, booms and busts, Amazon has evolved a set of guiding principles and cultural practices to keep its growth machine humming. These involve delighting customers, crushing competitors one by one, hollowing out retail sectors, and disrupting industry after industry, from bookselling to online retailing to personal electronics, and from web services and software to healthcare and beyond. Surveys show that 79 percent of senior leaders consider innovation as one of their top three priorities. Yet day-to-day, what often consumes senior management’s attention is the “delivery engine,” rather than the “discovery engine.” Not at Amazon. Founder and CEO Jeff Bezos has figured out how to spend the bulk of his calendar on innovation. He delegates to trusted lieutenants the implementation of ideas. Bezos spends most of his time examining how the world will look three, five and 10 years out. He is focused on baking in results for the third quarter two years from now. He sees his job as identifying and refining the Innovation Roadmap that will take the company from where it is today to where he wills it to be in the future, on time and on schedule. Most companies think of their assets as being things like their plants, equipment, and yes, their people. Amazon also places an asset value on ideas. Bezos is the ideator in chief. His zest for unconventional concepts, for enabling technologies, and for better ways of operating, is infectious. “I could fill this whiteboard in an hour with 100 ideas,” Bezos boasted to one interviewer, and there is little reason to doubt him. Bezos believes that a continuous stream of ideas is what fuels growth. He sees his function as creating the cultural alignment to value and respect ideas at all levels, and act with a sense of urgency to speed their implementation. Bezos sees his role as channeling this “opportunity mindset” to every individual, department, business unit, and outpost. Like a coach drilling his team on the fundamentals, Bezos reminds his people of the simple principles that have made the company great. With zero background in hardware, Amazon waded bravely into electronic devices with its Kindle e-reader in 2007. Everyone advised against it. Numerous setbacks and hurdles cropped up. But Kindle proved a game-changer and a confidence builder. From this wildly-successful foray, the company realized it could learn new skills if it was willing to assault assumptions. Amazon went on to pioneer the smart speaker category with Echo, and its Alexa device has 30,000 skills, mostly from third-party developers, who are building more applications all the time. Competitors are scrambling to catch-up. Amazon values experiments. A lot. Its website is a giant petri dish, experimenting constantly with pricing a/b tests, customization trials, recommendation algorithms and more. Amazon uses its hometown as a test market to gain consumer insights and feedback, and work out the kinks in new business models, before expanding or quietly killing off ideas that don’t have promise to scale. To observe how it prototypes and debugs new physical concepts, Seattle is the place to visit. You’ll want to explore Amazon Go, the company’s new automated convenience stores, which are pioneering the use of artificial intelligence and an array of overhead video cameras to revolutionize convenience store retailing. Next, head over to the Bitter Lake neighborhood, where you’ll find an Amazon storefront just opened so customers can pick up and return packages. Driving around, you’re bound to come across an AmazonFresh delivery truck, the result of five years of testing in the razor-thin margin grocery business. And be sure to pop into Amazon’s first physical bookstore, which opened in Seattle in 2015, and is now expanding nationwide. Amazon’s willingness to move first, to test, and yes to fail (witness Amazon Fire the firm’s disastrous foray into smartphones) have transformed it into not just an online retailer, but a movie studio, a hardware company, a grocer, or a web services provider – but an idea factory. The key is monetization. While Google and other firms spend billions researching artificial intelligence and machine learning, Amazon is interested in monetizing artificial intelligence and applying it in every aspect of the organization. Amazonians are on the lookout for AI applications they can place inside products, use to enhance services, and install in physical locations. The company will often invent something or develop some new capability for its own needs, only to find that it can monetize that invention for others. Amazon has a different take. They operate from the belief that you can listen to customers through the data. They believe that if you’re simulating and building models and milking the data, you can let customers lead you to insanely great offerings by divining what the data suggests they will want before they even see it. Amazon has artificial intelligence engineers embedded in every business unit, every team, every region, and every warehouse. And they use data to drive faster, more accurate opportunity creation. Amazon innovators are taught to constantly ask themselves: what does the data tell us about what customers might want next? At Amazon, going along to get along is not a virtue. Heated debates often break out over what to measure. Creative tension, rather than laid-back harmoniousness, is believed to spur the best thinking. At many companies, would-be innovators must garner dozens of yeses before pursuing an idea. A single “no” can derail. At Amazon, no single manager has the right to kill an idea. The company is structured such that hundreds of managers can green-light an idea, at least to the next stage of development. At Amazon, a high potential idea must meet three criteria: it must be original and not “me too.” It must be scalable. And it must have the potential to produce a significant return on capital. The company constantly experiments with new thinking methods. One example, introduced by Bezos, is known loosely as The Narrative. Before making decisions on high-investment initiatives, senior team meetings start with a period of silent reading of a memo that Bezos has commissioned. Bezos is particular about how the [up to] six-page narrative is composed. “It must have topic sentences, verbs, and clear thinking throughout,” Bezos insists. Then, he and his senior team convene and pour over the memo for up to 30 minutes, scribbling questions, preparing for an oral discussion of the merits of the idea. “For new employees, it’s a strange initial experience,” Bezos admits. “They’re just not accustomed to sitting silently in a room doing study hall with a bunch of executives.” Strange yes, but powerful as well. And just one more way in which Amazon innovates how it innovates.